More and more persons are coming to the realization that astrology is a valuable tool in making one more aware of their own role in their own life's experience. The more aware we are of certain conditions, attitudes, and inter-actions with other the more fulfilling and successful is our life. 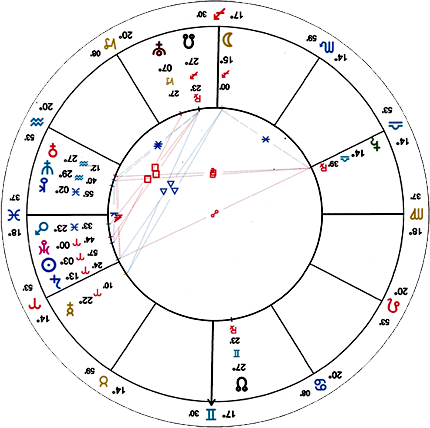 birth chart) and the events of our daily lives. Modern astrology's roots go back over 5000 years, it is a language of cosmic symbols and principles that can teach you more about yourself, and the world as "YOU" experience it. Your Horoscope chart provides a snapshot of the planetary positions at that moment when you took the first breath of life. With that first breath of life, an energetic vibration, or pattern is imprinted on the cellular memory of the human body. Energies that are projected from the planets in our solar system come through the ionosphere at the same rate of vibrations as the human body. therefor we are all connected to this magnetic force. This energy always exists within us, guiding our decisions, lessons, and paths we choose to take. In other words, in addition to our own DNA there is another type of Cosmic DNA. Of course individuals have their personal chart done for many different reasons. I can't tell you your future, why ? because you create your own experiences, but I can make you aware of the potential conditions, and changes that lie ahead. There are other valid methods of gaining more insight about yourself, or others, or situations. No doubt in my mid that Astrology is one of the more fascinating one. Weiss Kelly, PMAFA P.O. Box 13913, Scottsdale, AZ 85267.